You are here:Home Psychology of singing Can anyone be taught how to sing? The first time I hear the voice of a new student is often through my studio intercom. I’ll never forget the day Rick* buzzed up for his first voice lesson. Oh boy! I quickly mustered every ounce of teacher-ness within me as Rick made his way into the building. For the next hour, I needed to be on my A-game! Rick was a sad but kind soul, always apologizing and never making eye contact. Life had beaten him down one too many times. At this point, I prayed I would somehow be able to help Rick. Music can be a healing agent. Singing can be therapy. He was in desperate need of both. In the voice of Gollum with the flu, Rick proceeded to croak the same three notes (and not the notes I was playing) over and over, no matter the key I played them in. Up until recently, I always thought only 0.5% of the population was actually tone deaf. In that studio that day, if ever there were a time to throw my hands up and tell Rick he unluckily fell into that small percentile, it was then! Perhaps if I let him know singing was a dead end, it would release him to find another passion in life. What Rick lacked in natural talent, he made up for in heart and work ethic. Within six months, he was not only matching pitch, but he was singing 1.5 octave patterns up and down through his entire range, connecting his chest voice to head voice. And if he sang one note slightly sharp or flat, he would ask to redo it. Learning to sing had given Rick purpose and a rediscovery of life. And honestly, I wasn’t concerned if he never fully dropped all the constriction and nasality in his voice. Something greater than the two of us had happened in that studio. If the definition of a tone deaf person is someone who is unable to learn to match pitch, Rick, as it turned out, did not qualify as one. So if even he was able to learn how to sing, do tone deaf people actually exist? Or can ANYONE be taught to sing? As a voice teacher, I have never wanted to be the person to tell someone they can’t do something, especially with so much anecdotal evidence of seemingly “tone deaf” students like Rick eventually learning to sing. I always assumed most people labeled tone deaf by family members or choir masters were actually just inexperienced, untrained singers. It would be like putting a tennis racket in my child’s hand for the first time and calling her “ball blind” when she can’t hit it back. Her motor skills have not been trained yet to play tennis. She doesn’t need a label—she needs tennis lessons! However, in the last decade, new research suggests the existence of an actual neurological condition called amusia, which is the inability to hear differences in pitch, tone, and sometimes rhythm. Cognitive neuropsychologist Isabelle Peretz explains that most children learn to sing much like how they learn to speak, almost automatically, rather than through formal training. However, tone deaf children do not develop this, suffering from a condition she calls congenital amusia, a learning disability for music. The “amusic” population, as they are called, are calculated at approximately 4%. Some research even suggests that tone deafness is a hereditary condition, more common among siblings. Studies of amusic people reveal that difficulties processing melodic information can be traced to two areas of the brain, the frontal and auditory cortexes. Similar tone deaf symptoms have also been observed in people who suffered accidental brain damage in these two cortexes. Some scientists suggest that, like other learning disabilities, congenital amusia might be treatable, hypothesizing that amusic children might have enough brain plasticity to be trained to distinguish musical differences. So far, positive results in these studies have been negligible. What does this mean to me as a voice teacher? So if tone deafness is not actually a myth and could possibly be irremediable, how do I handle new singers like Rick when they come to me, wanting to learn to sing? Do I take them on as a student and try to teach them how to match pitch? Or should I save them the cash, sweat, and frustration and point them toward another hobby? Before any more lessons are scheduled, a reality check is in order. I give the student a full appraisal of their voice, making sure they understand what their strengths and challenges are. 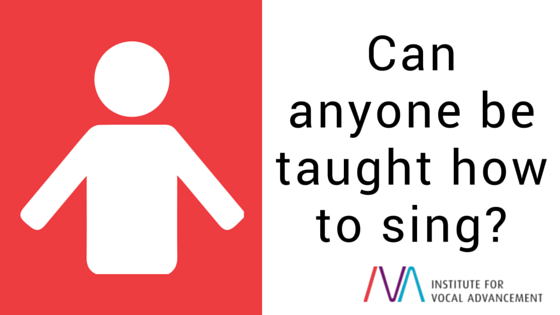 This is the time to ask the student why they want to take voice lessons. Do they realize how much work they will have to put in and that it will probably take them much longer to reach the basic competence that others take for granted? Do they want to learn to sing that badly? The student needs to be teachable, open to new experiences, and willing to be patient. They must approach these lessons ready to do exercises, ear training, strange “unfinished” sounds, and other activities that don’t immediately sound like singing. In fact, months may go by before they are able to sing through a simple song from beginning to end. If the student understands these challenges and shows a positive working attitude, I will probably take them on. We both will need to embark on this new journey with open lines of communication. Periodically, we will reassess where they are at, and, if after a few months, we seem to be hitting an impenetrable wall, perhaps that is the time to find another hobby. The research suggests that a small percentage of people cannot learn to sing, but so far, I haven’t found any such person yet. I love this article! it’s full of heart and encouragement. I agree with you and I also take these kind of students and see good results. Yes, it does take time and much effort, but if the person is willing to do all this work – he gains so much in return, that it is worth it for both the student and the teacher.